Have you ever tried to do yoga with a goat on your back? Did you know there are actual health benefits of doing yoga with animals? Check out this article that claims it can increase serotonin, decrease anxiety, and even lower blood pressure! Join us for this FUNdraiser that is sure to get you laughing while raising funds to help the continuing work of Tapestry. 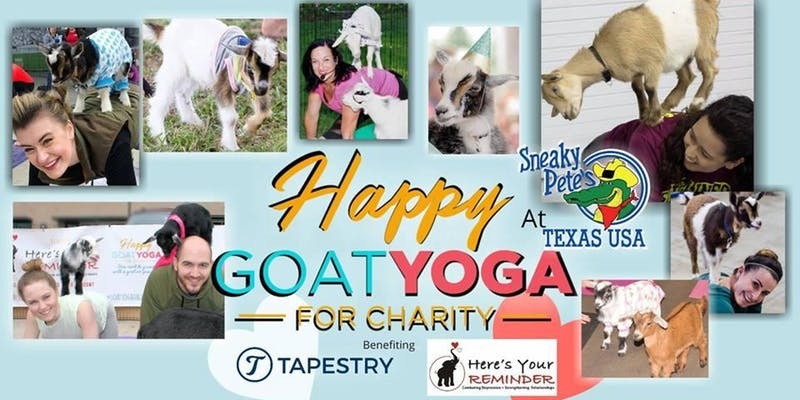 There will be a special playtime with the goats after the yoga, so bring the whole family! You won’t want to miss it! Not able to make it? Consider donating your $35 directly to Tapestry to purchase a weighted stuffed animal for a kiddo in foster care coming out of a residential treatment center or psychiatric placement, or to help offset the cost of counseling sessions for an adoptive family.